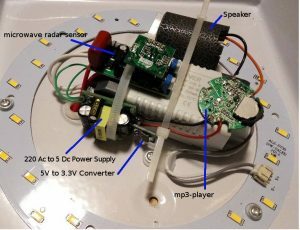 In this project, I‘m going to build a simple motion detector circuit with a mp3 player. The idea is based on: If somebody passes through the doorway, the circuit should detect it and switch the light on and play a music. 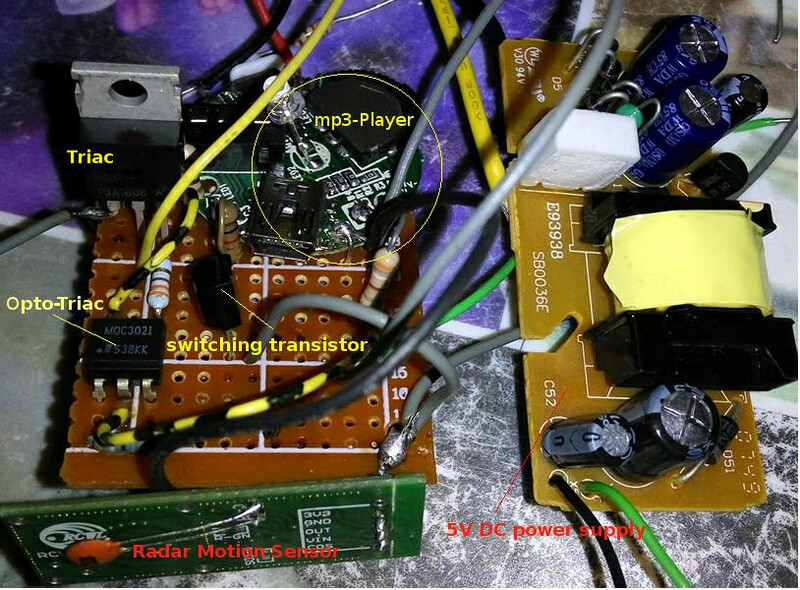 The main component that I used is a microwave radar sensor and a small mp3-player. The motion sensor and mp3-player need between 5V of power to operate, therefore I used a 5v USB phone charger. On sensor pin 2,4 receives the 5v DC voltage. The pin 3 is the Output of the sensor. 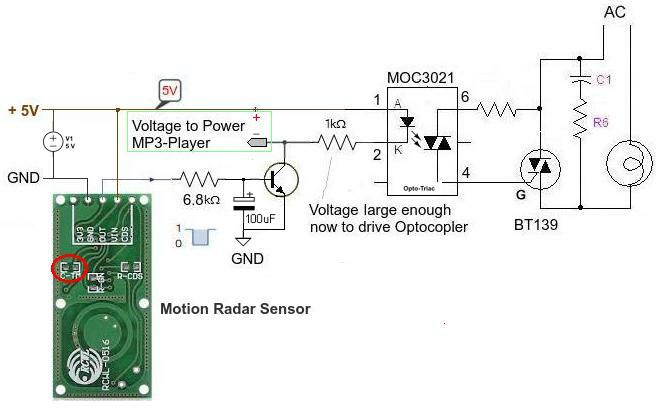 When motion is detected, this output goes high to 3.3V. This 3.3v output can power a LED with 20mA but this current is not enough to turn on the optocopler. 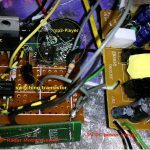 To handle this problem, I connected the output of sensor to the base of the transistor BC547. This transistor feeds the mp3-player and the input of optocopler. The output of Traic can turn a 30W 220v AC LED light on. In order to extend the light-time, I soldered a 33nf to the C-TM contacts on the sensor. It extended the time more than 45 sec. May you do NOT necessary to develop your own switch. Currently who wants can buy the device from the Chinese resellers for about 3$. It’s can switch up to 30 watts. The max distance range of the radar is about 7m. The device have two potentiometer for adjustment of sensitivity and time. This range can be limited to 2m by adjusting the sensitivity potentiometer. Radar sensor can detect a moment in behind a wooden door and if the room is smaller than minimum range (and that is my case) than the light will be on by any movement behind the door.